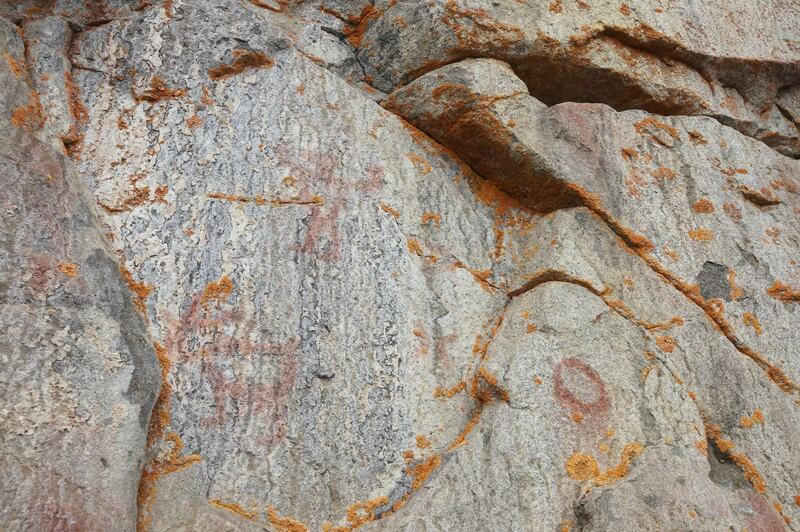 ← The Pictographs of Wabakimi’s Cliff Lake – Selwyn Dewdney Takes Us On A Tour! 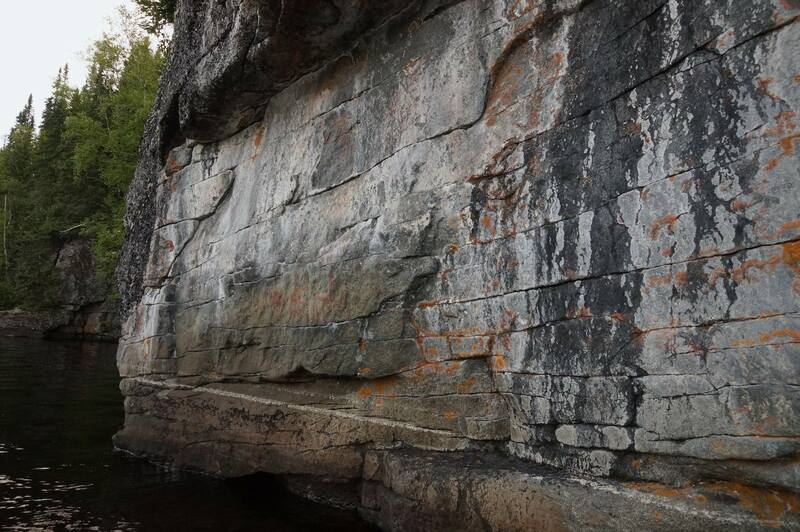 Part One in this tour of the pictographs of Wabakimi’s Cliff Lake, which is a part of the Pikitigushi River system in northwestern Ontario, ended at a site Selwyn Dewdney labelled #219. 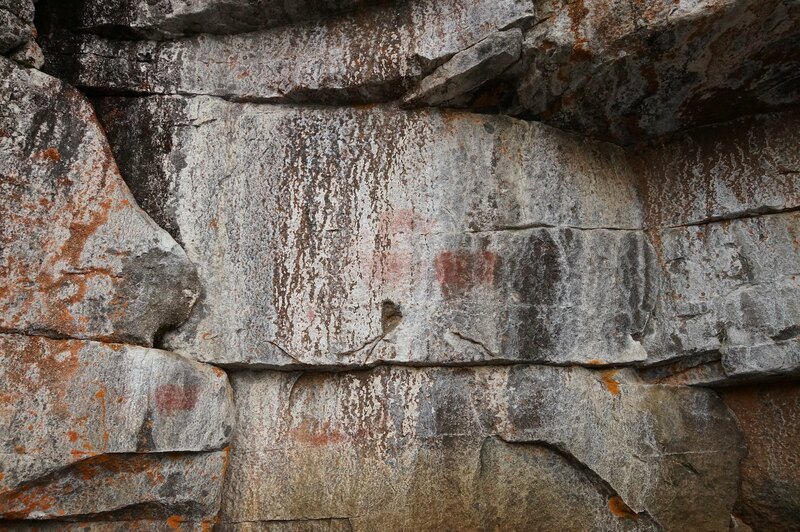 Site #219 is a part of what Dewdney, our guide for this tour, considered to be the central section, in spite of the quality of the pictographs found at the south end of the lake and shown in Part One. 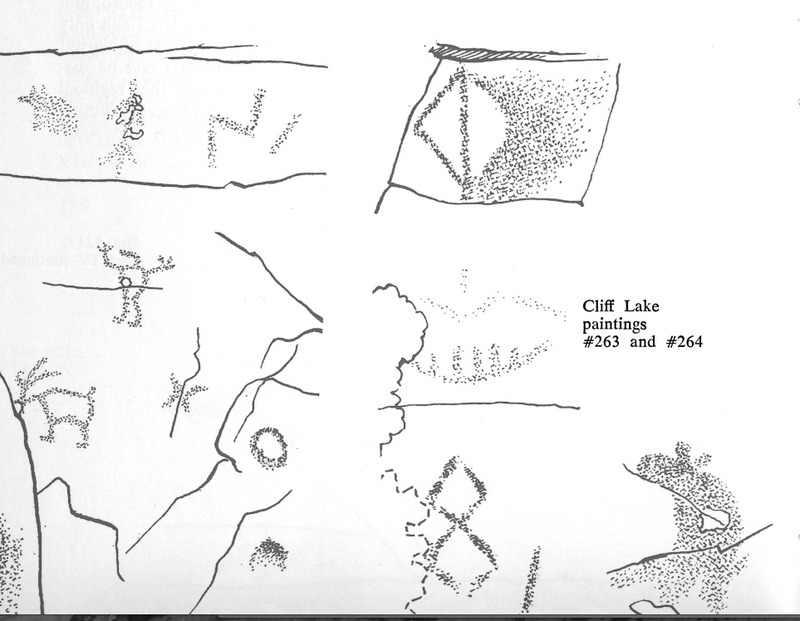 Dewdney had made two visits to the lake in the mid-1960’s and included his observations in the second edition of Indian Rock Paintings of the Great Lakes, the book which established the systematic recording and study of Anishinaabe pictographs of the Canadian Shield. See here (pp.135-141) for downloadable pdf copy his account of the visits. 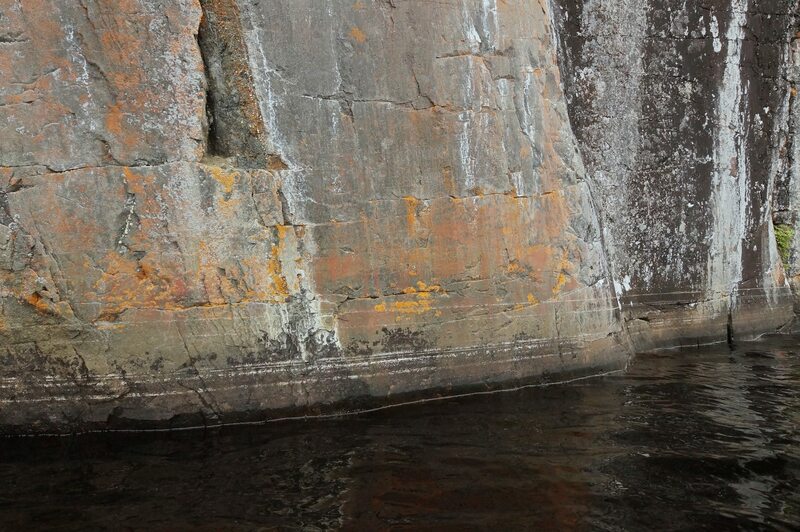 Paddling closer to the above corner of the rock face, we were rewarded with another small image – perhaps four inches long but clearly visible. 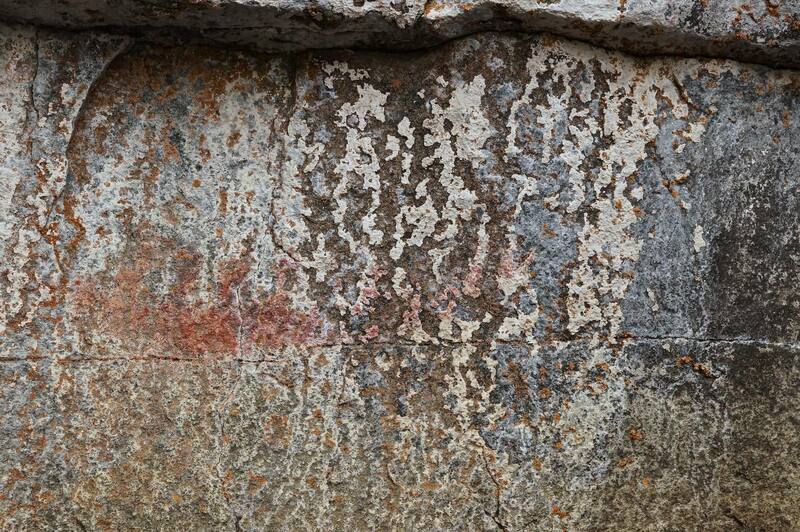 Dewdney provides a couple of possible explanations for the smudgy nature of many of the pictographs. 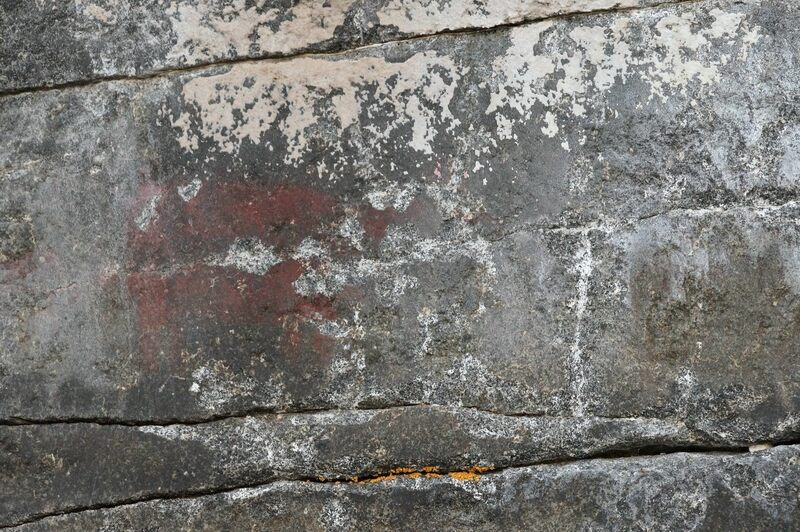 On the one hand, as indicated in the quote above, he concludes that the blurred nature of many of the pictographs is a sign of their great age. 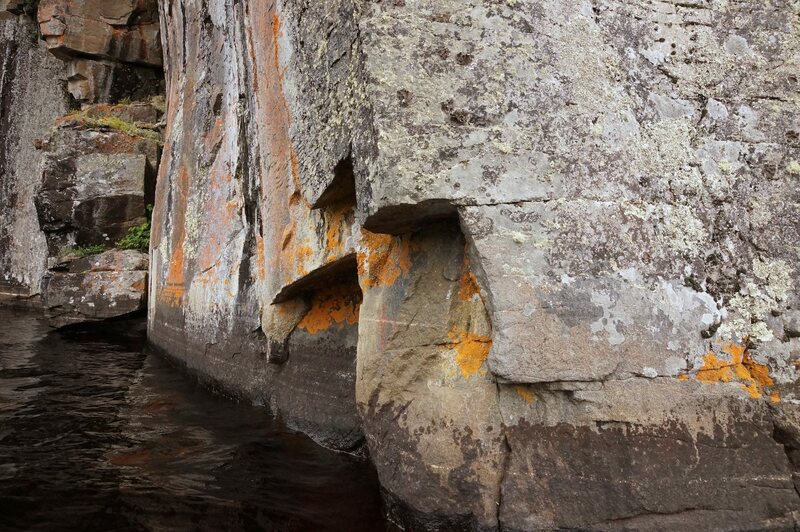 He also proposes the following explanation: while the rock face at the south end of the lake is granite, the rock on the east (and west) sides of the lake as you paddle north is basalt. 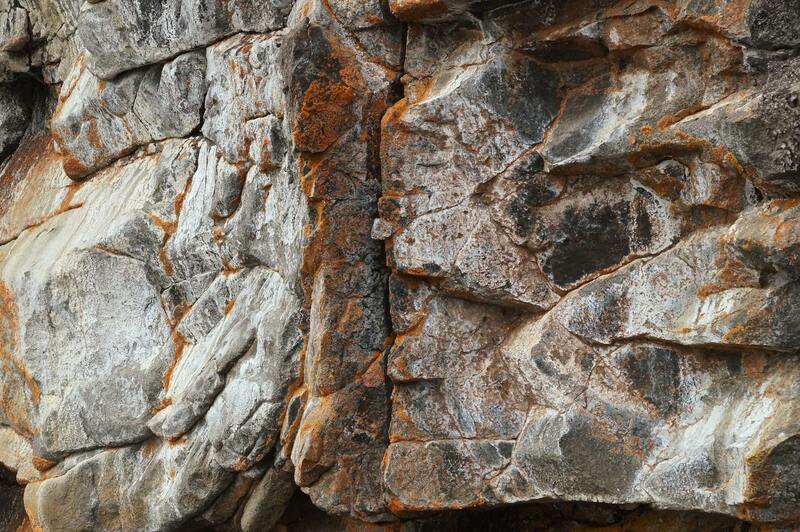 He suggests that perhaps the ochre/fish oil bonded better to the acidic granite than to the basic basalt. 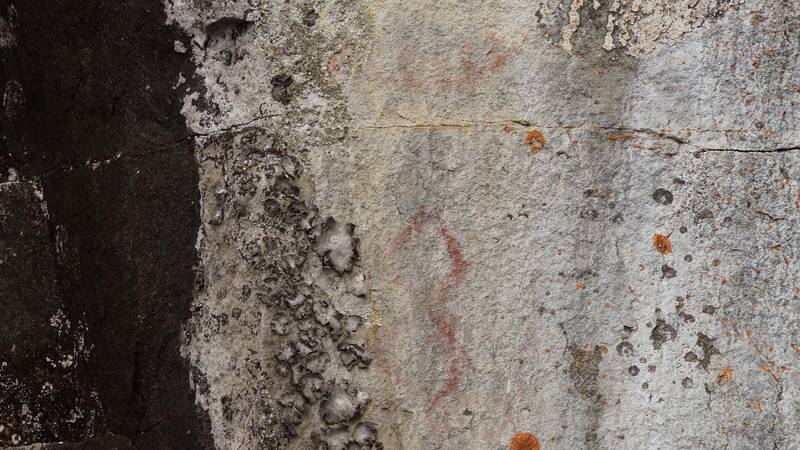 Cliff Lake – fading ochre remains – is it a human figure? 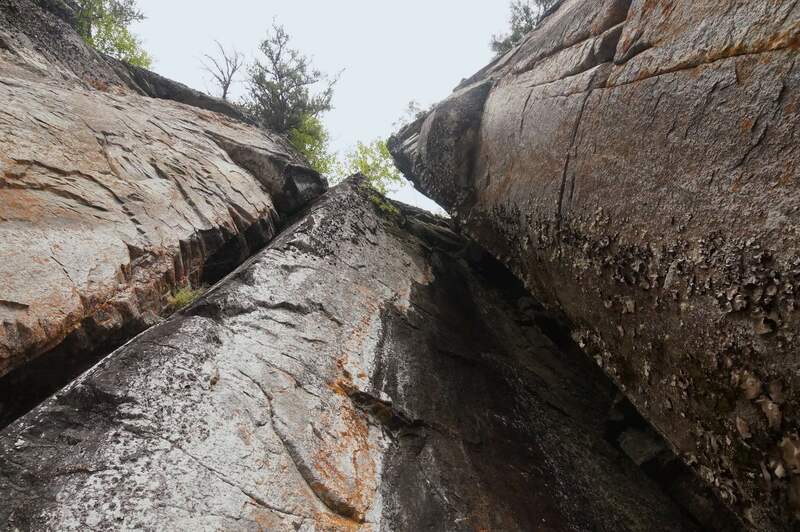 Just north of these images, we came across a small trail at the north end of the rock wall. 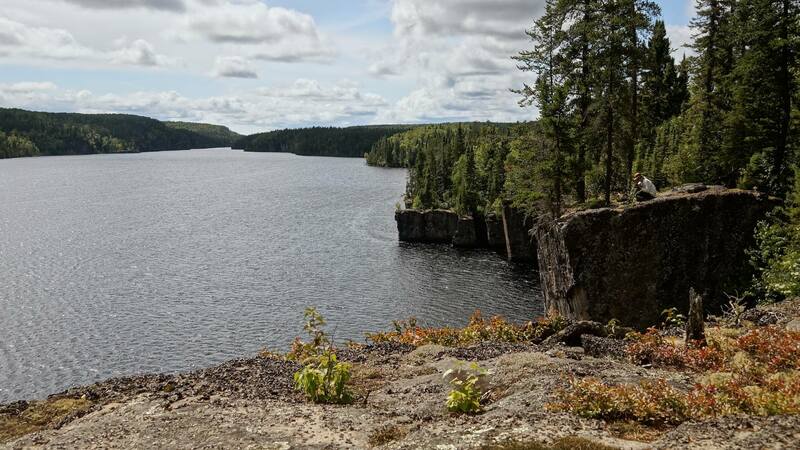 Getting out of the canoe, we scampered up and were soon up on top of the cliffs and looking at an excellent campsite that would be worth the effort of getting the gear up there. 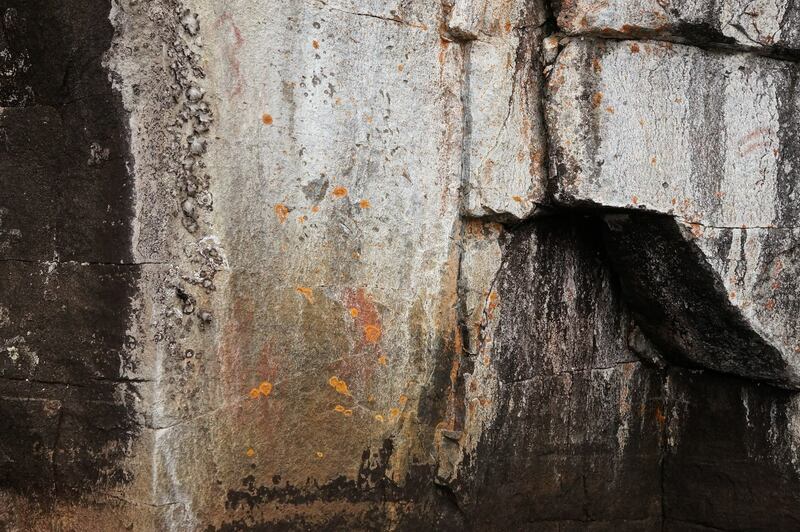 This shot of my brother standing near the edge doesn’t really capture the sense of being up there but it will give you a rough idea! Now that we are back in the city, I am left asking myself the question – Why didn’t we spend another night on Cliff Lake? We could have moved down from our other campsite to this one and revelled for another night in the privilege of just being there, two of maybe ten visitors the lake will see in a given year! Looking at the cliffs in the above image, it is clear that a brief scramble from the south end and we would have been on top looking back at the campsite and at each other and saying for the umpteenth time that day – Wow! A missed opportunity – and yet another reminder for us to slow down just a little! 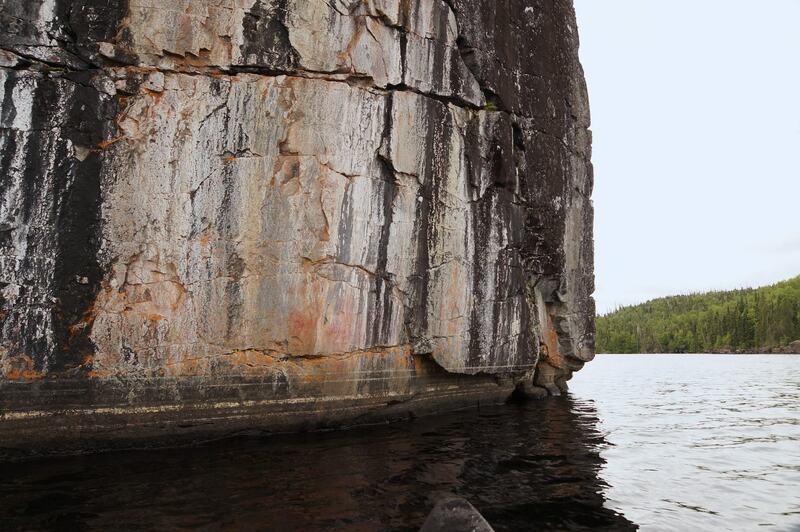 We were hoping to have found one of the faces as we paddled towards this rock. 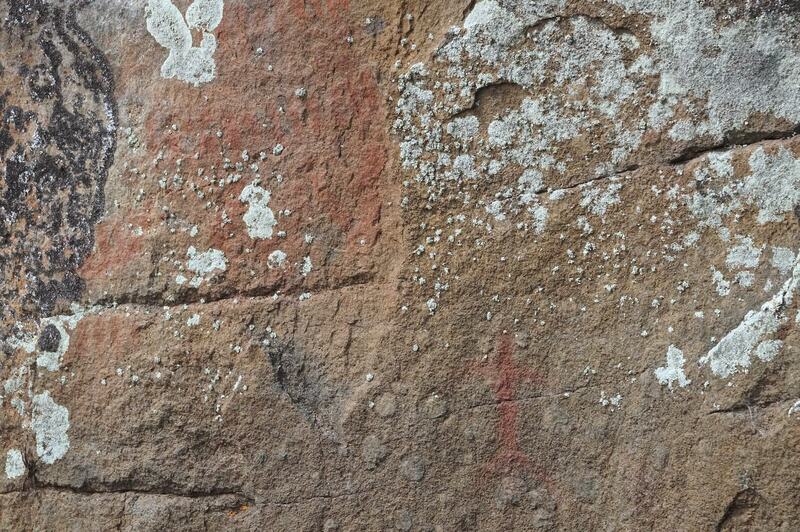 As we got closer we saw the panel illustrated by Dewdney on the top left hand. Here we were in 2013 and it really did not look all that different! 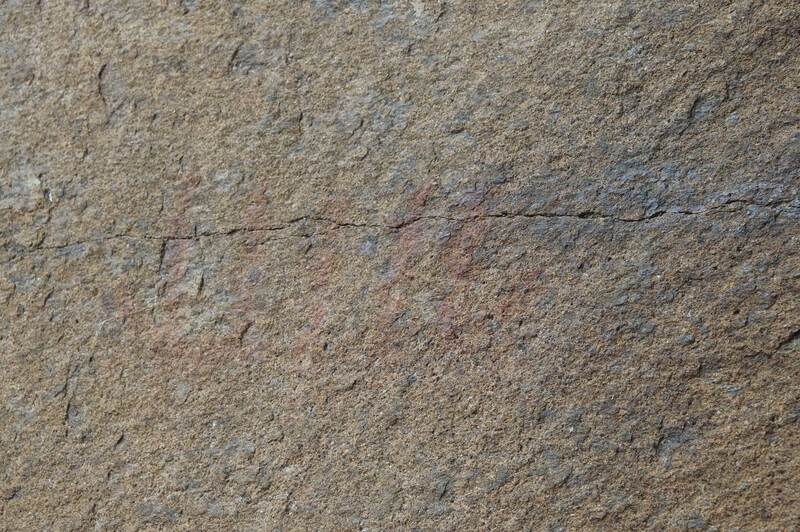 Nearby was this indecipherable bit of ochre – may be a woodland caribou or moose or two? 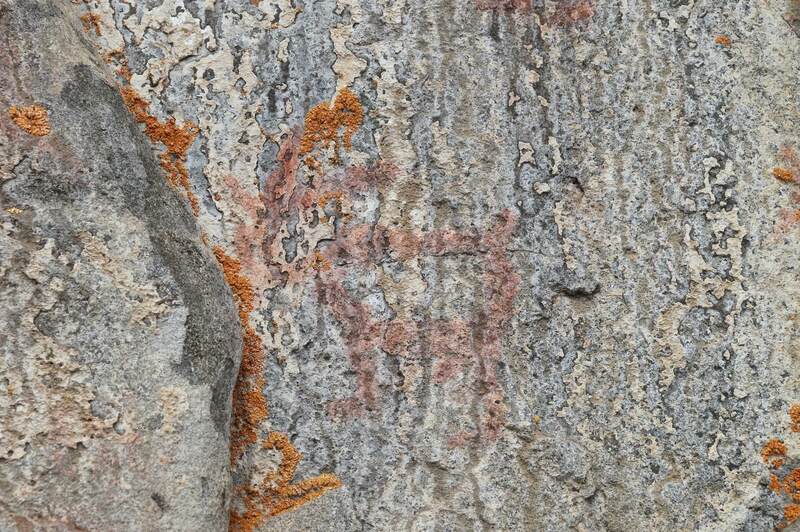 unclear pictograph on Cliff Lake Rock face – two woodland caribou standing next to each other? 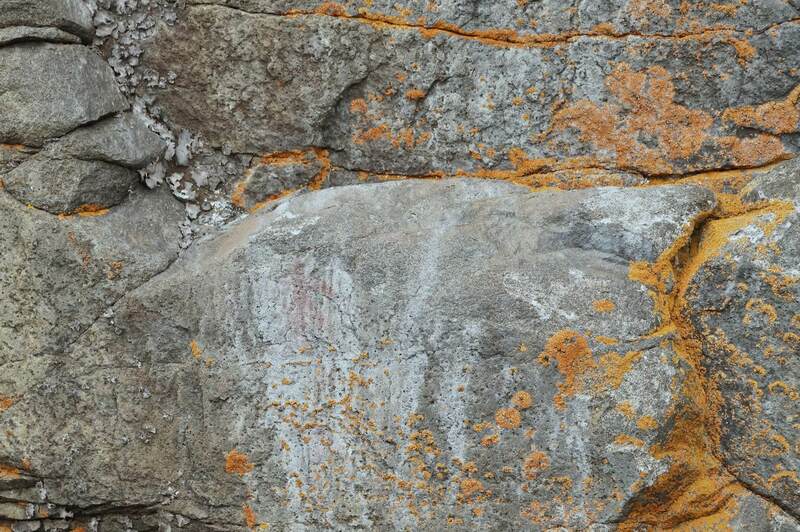 Zooming in a little brings us closer to the woodland caribou and the human image Dewdney refers to. 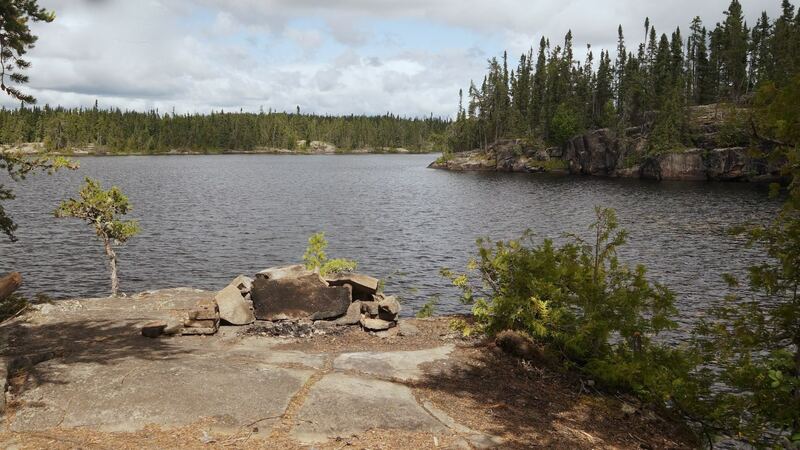 Our camp for the one night we spent on Cliff Lake was about forty meters in from this fire pit on the breezy point. 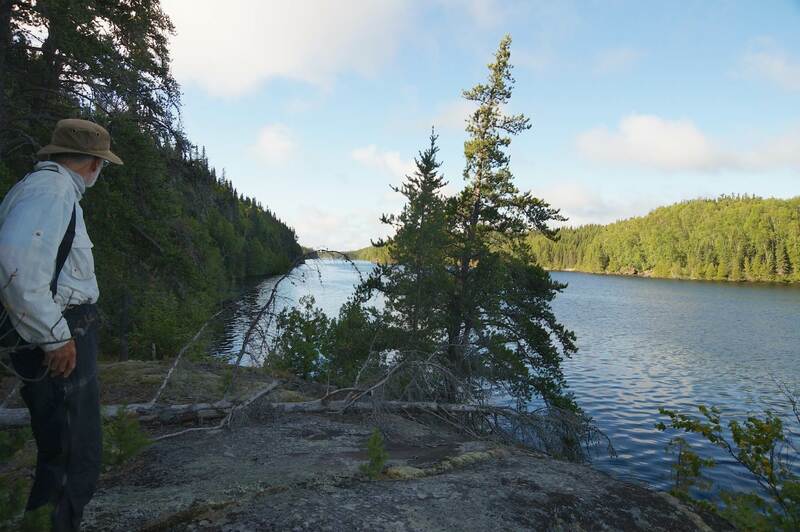 Of all the campsites of our seventeen-day paddle, it was the best. Standing at the point you are looking at the north end of the lake where it narrows. 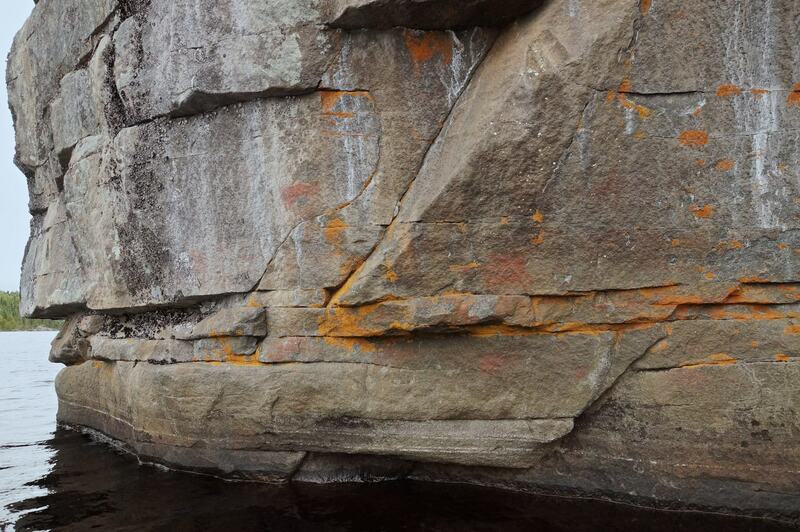 To the left of the fire pit is the first of the really dramatic rock face sections on the west side of the lake. Of the campsite itself, the only other one on the lake that could have improved on it was the one down the lake a bit. We should have stayed there a second night! Don’t make our mistake when you visit – linger and savour! 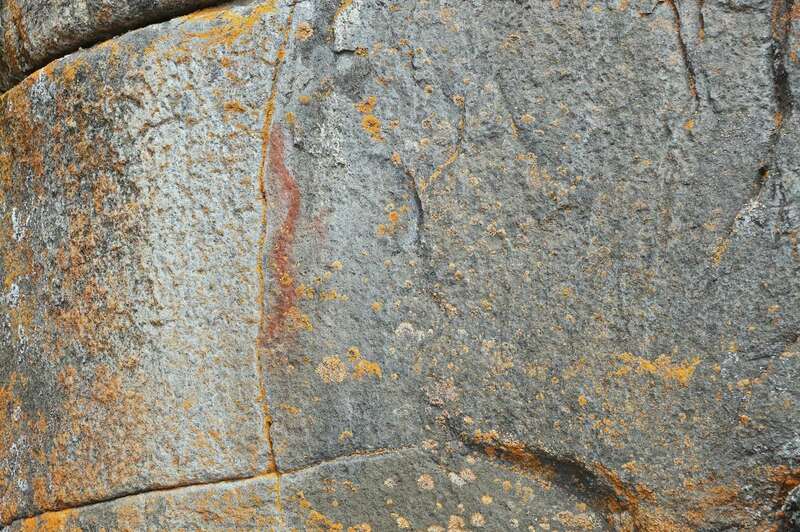 We spent about five hours scanning the cliffs for evidence of pictographs and were definitely rewarded for our efforts as the images above attest. 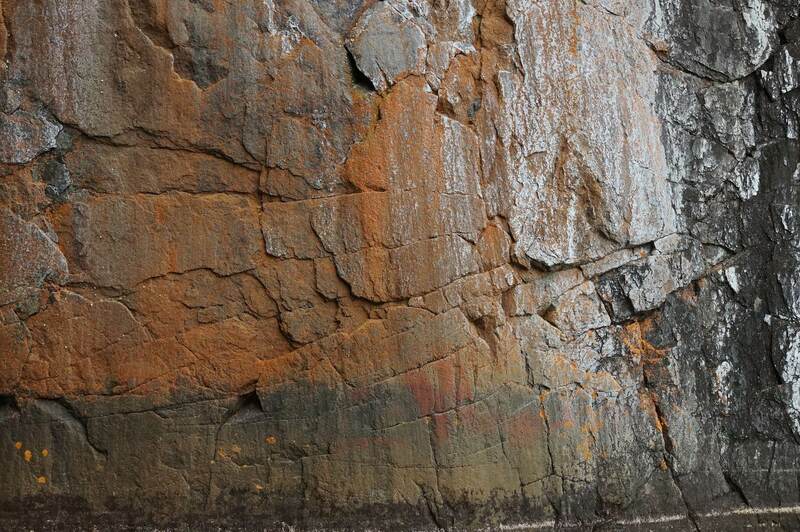 On other occasions, you end up staring at the rock face and, even while not seeing any trace of ochre, you can’t help but saying -“Man, Would you look at that! That is a work of art!” The one below served as my screensaver last week! 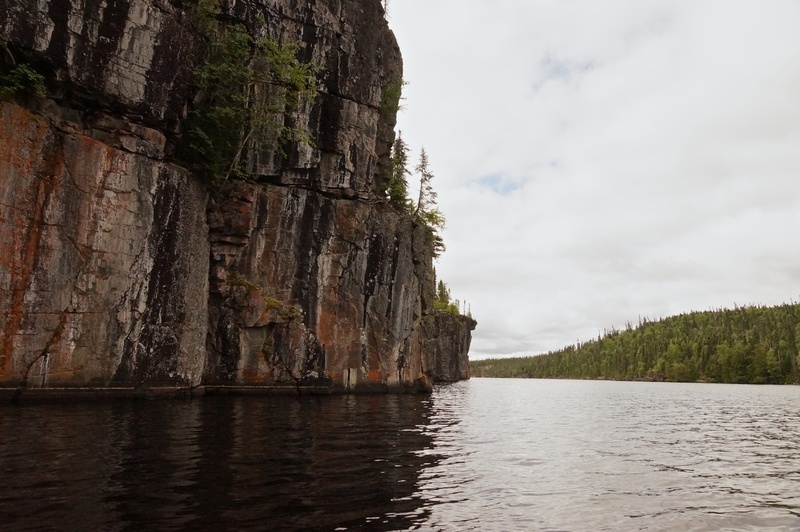 I have yet more pictographs which I could upload but I’m hoping I’ve made my case, which is quite simply this – Cliff Lake is a paddler’s dream lake that has to be visited. 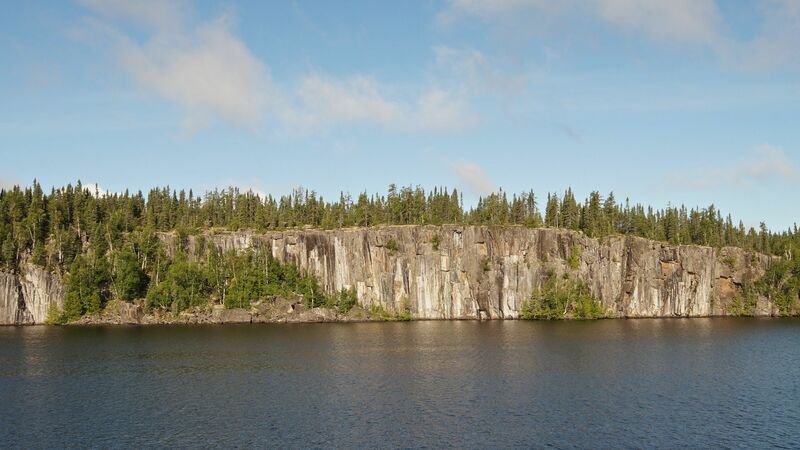 Given the evidence on the rock faces of the lake, I’m only restating something that generations of Anishinaabe shamans (aka “medicine men”) and young men on vision quests knew to be true. Yes, there is a price to be paid to get to this special place – there are some gruelling portages, no matter which way you come – but you will be rewarded! 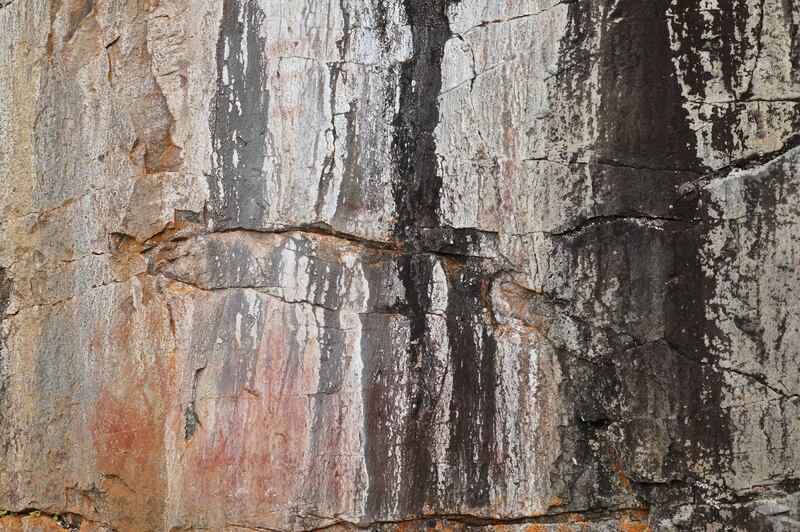 A Technical Note – Sometimes posters of pictograph images are tempted to help the images out a bit by playing with contrast and saturation levels. 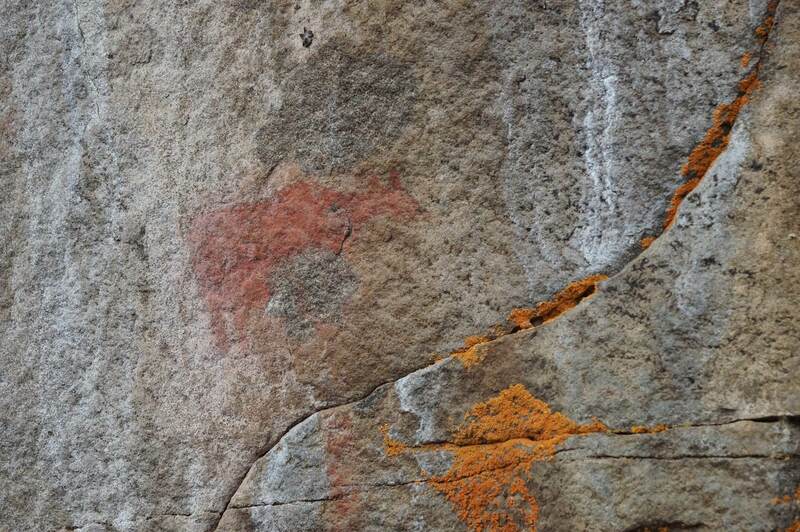 While this may make the pictographs “pop”, it also creates a false impression about the colour, the tone, and strength of the images. The results in some cases are downright cringe-worthy. I resisted the temptation and have let the images, in all their faded glory, speak for themselves. Ultimately you just have to go to Cliff lake and let them speak to you. 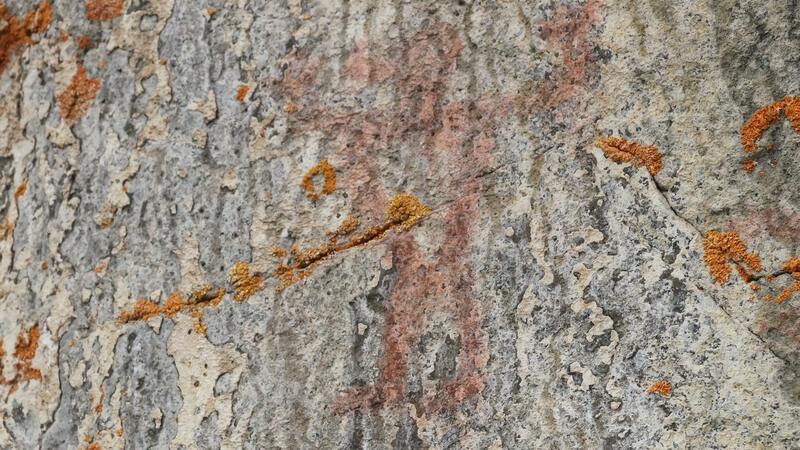 Postscript: I must thank Jann Kinunen for getting in touch and providing a link to his incredible site on pictograph sites in Finland. 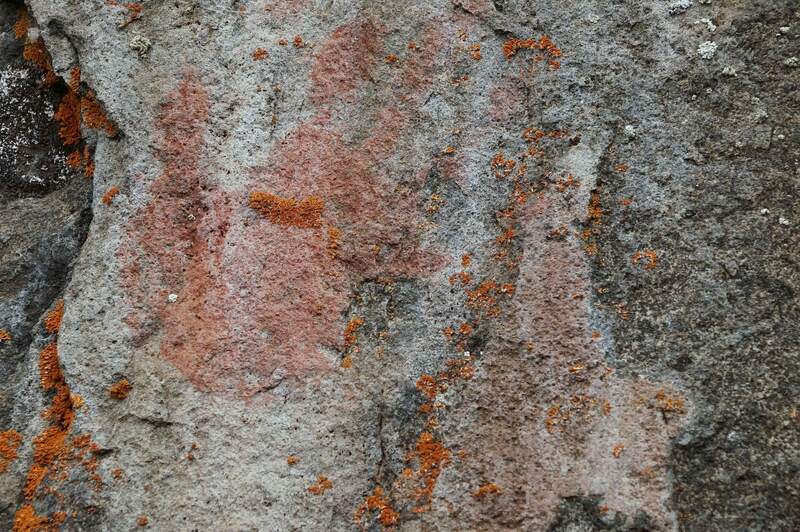 It makes me reconsider my rather categorical rejection of touching up the pictograph images. Click on the following link to see what he has done – it works! 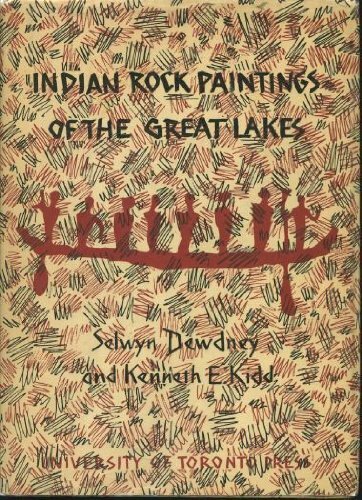 In 2014 the University of Toronto made available an online copy of the first edition of Selwyn Dewdney’s Indian Rock Paintings of the Great Lakes. Click on the book title to access the book at the archive.org website. However, Dewdney only got to Cliff Lake after it was published. Five years later a second edition was published with 140 more sites, Cliff Lake among them. 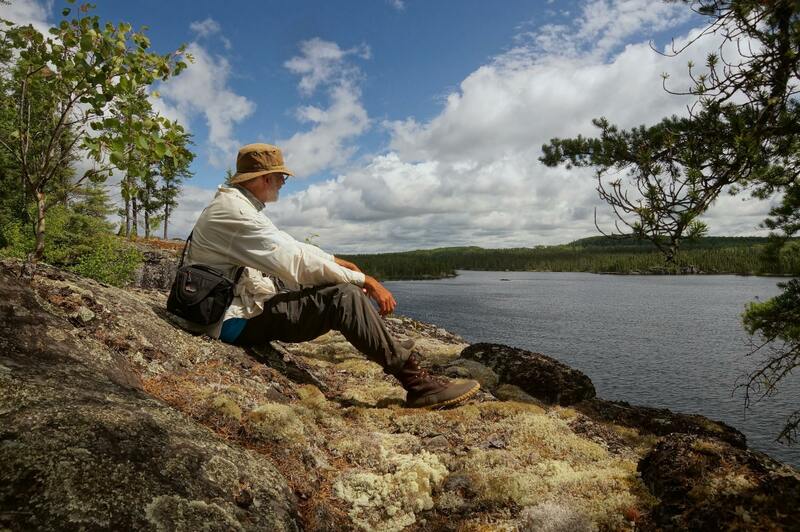 Dewdney organized the results of his 1965 and 1966 findings into five different sites. 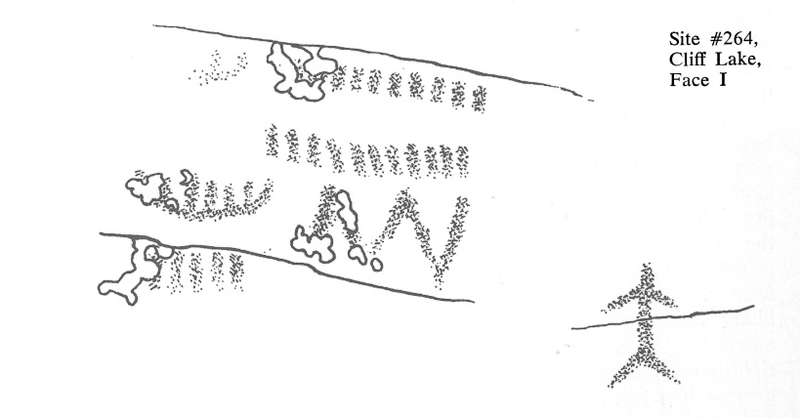 See my map at the start of this post for approximately where they are. Given how difficult it is to find the book, I’ve scanned the additional material found in the 2nd edition. Click here for a 7 Mb pdf file. 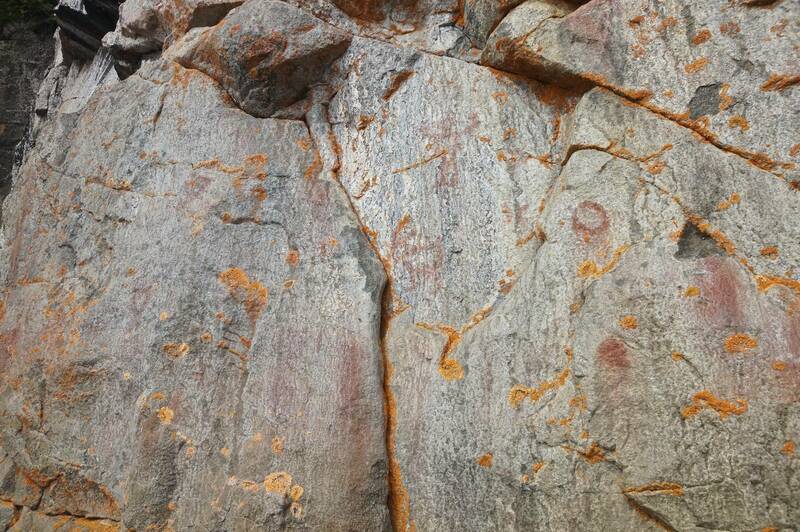 Pages 135-141 cover the Cliff Lake pictographs. 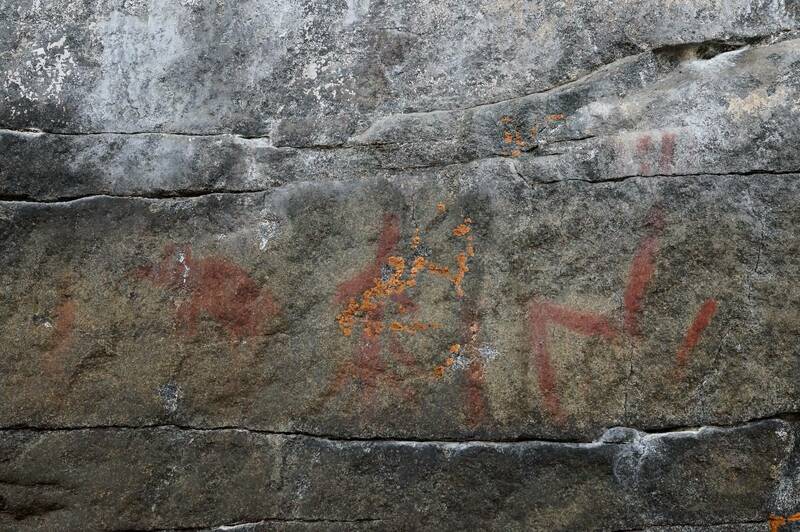 This entry was posted in Pictographs of the Canadian Shield, wilderness canoe tripping and tagged aboriginal rock art, Anishinaabe pictogrpahs, Canadian Shield rock art, cliff lake pictographs, ochre rock paintings, rupestre ontario, Selwyn Dewdney and Indian rock paintings. Bookmark the permalink. Janne, WOW! What an incredible resource you have created for pictographs in Finland. I can see that you have been at it for years and have adopted an interesting technique of creating before/after images with a simple mouse movement. 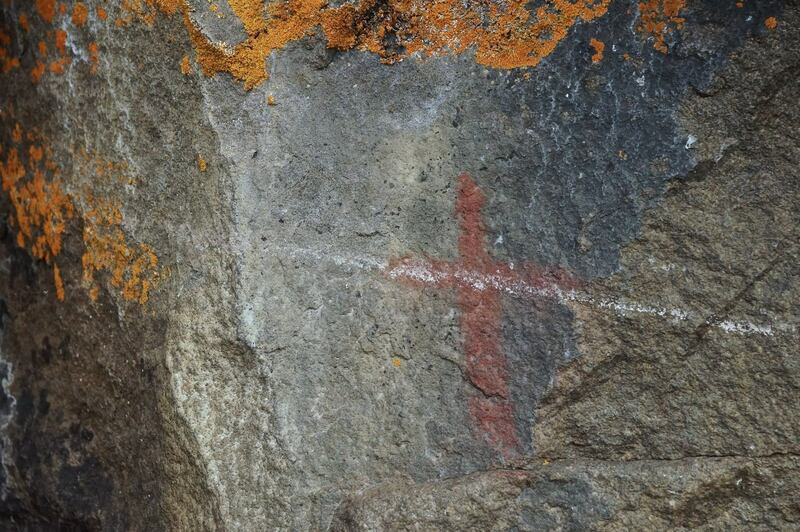 The ochre looks the same but from your comments it would seem that the Finnish pictos are much older than the ones I’ve documented in the Canadian Shield area. Thanks for getting in touch – and for giving me some ideas on how to improve my own presentation in the coming months.